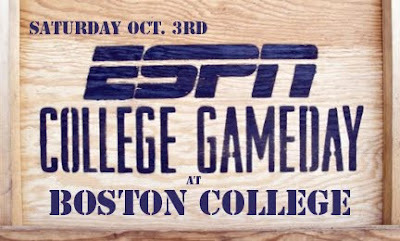 Chestnut Hill will be the setting for ESPN’s College Gameday this Saturday(starting 10am EST), and I think that Mark Herzlich is a big reason for the trip. Last week an ESPN crew spent the day with Mark and his family last week documenting his chemo treatments and interviewing his family. I foresee a sit down interview with Mark on that College Gameday stage and then a feature on Mark’s treatment and recovery. This is going to be a huge day for Boston College Football and a great show of respect to Mark Herzlich. Show your support, wear your gold, and get there early. Hey Mark… Stay Up! Go Eagles!